Attending to a dying loved one in the peace and quiet of the home with caring children and grandchildren surrounding the bed can be a spiritual experience for all involved. Hospice can allow this to happen. Memories of a loved one passing in peace can provide great comfort for family members in years to come. When there is no longer hope for prolonging life, especially when this decision is made months in advance, hospice is a better alternative to hospitalization. 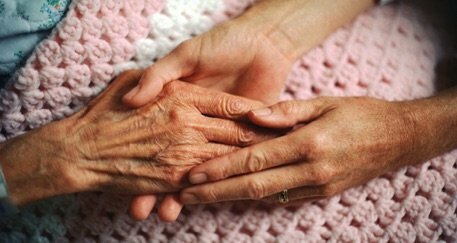 Hospice is a form of palliative care that treats the discomfort, symptoms, and stress of old age or terminal illness. Hospice seeks to optimize your loved one’s comfort and quality of life at the end of life, while neither hindering nor hastening the dying process. It allows for compassion and dignity in the process of dying. It is a valuable service and is generally underused except for terminal cancer patients. Most families wait too long to have their doctor prescribe hospice from Medicare. Hospice is appropriate for Alzheimer’s and degenerative old age. I have been trained by both Providence Hospice and Evergreen hospice as a patient volunteer one of the members of the hospice team that serves the dying. I served in both organizations supporting families and their loved ones during the last months and weeks of their journey of life. I am a founding member of the National Home Funeral Alliance and a certified death midwife. Provide education about the choices available to all of us at death; comparing the costs of products and services of a funeral home vs. home funeral, comparing the experiences of the family in a funeral home setting vs. a home setting. Share the purpose and process of embalming and not embalming. Discuss the grief process. Compare the ecological impacts of burial sites and cremation with green burial. Meet with individuals, couples or families to create pre-planning documents for the event of death: the will, medical directives, financial directives, and disposition of the body statement, what kind of memorial service, burial or cremation. If the individual wants to die at home, I can help create palliative care plan. Support families to fulfill the wishes of the departed as stated in the pre-planning documents. Facilitate bringing our loved ones home for the rituals around death. Support and guide families to care for the departed, washing, dressing, ceremony, ritual, etc. Hold the vigil, creating a sacred space for grieving, honoring and storytelling of the departed loved one. Take care of ail the legal documents post death. Facilitate transportation of the loved one. Communicate with funeral home, crematorium or cemetery if the family wishes.